This 2 ingredient scroll recipe using Greek yogurt and self raising flour has been around for years. We’ve been making these for a long time and they’re always fun to make and taste delicious too. 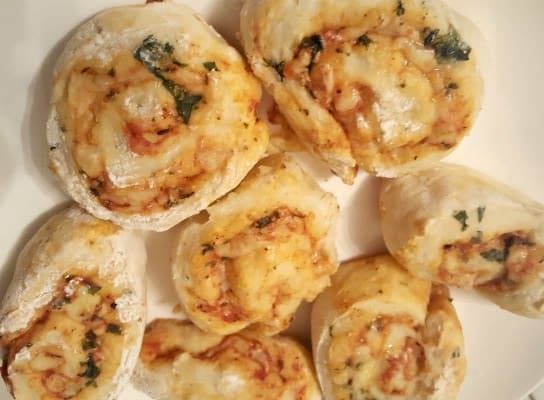 You can use the same recipe to make pizza bases too, but for today we’re going to make scrolls. 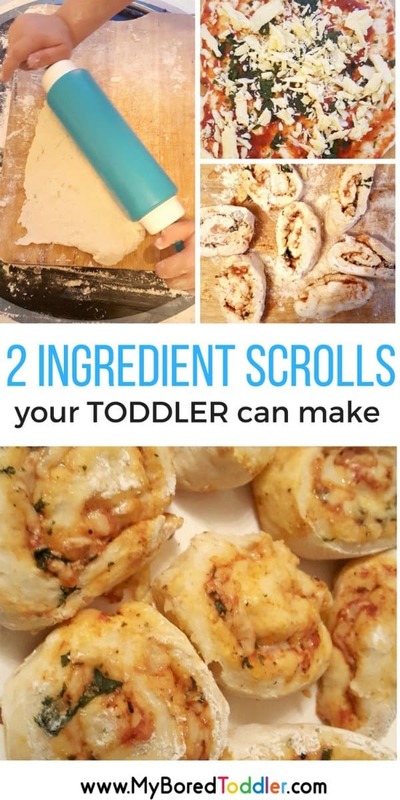 This 2 ingredient scroll recipe is part of our 5 day Toddler baking challenge (you can still sign up HERE). 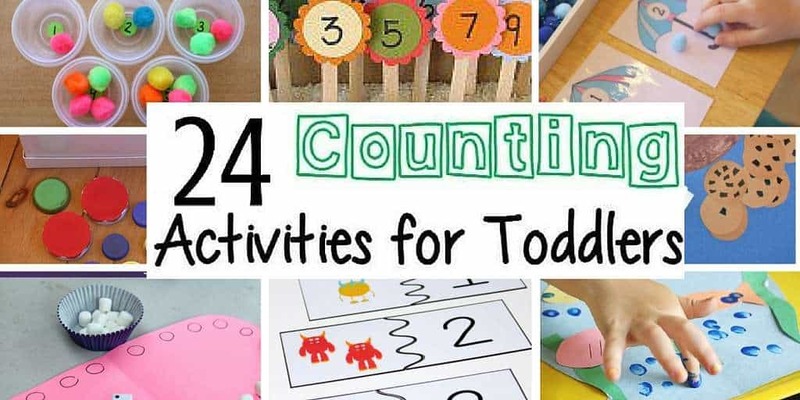 I remember making them when I was younger and I really love letting toddlers make these as they can’t really make a mistake! The dough ends up like a playdough consistency so they love kneading it and rolling it! Once again this is a bit messy, flour WILL end up on your floor but it will be fun! As I mentioned in our banana bread recipe find a spot that works for you when baking with your child. It doesn’t have to be the kitchen. 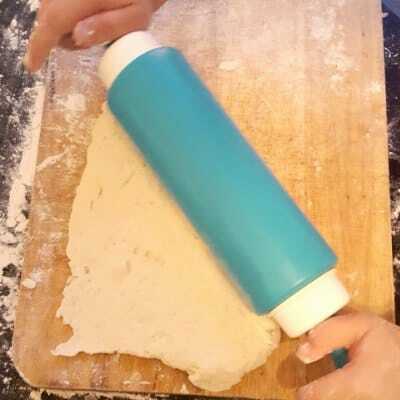 Rolling Pin (you can get kids size ones like this or use ones from your playdough set!). Have your child add the yogurt and self raising flour into the bowl. Let them mix it all together. This bit may need some adult help but let them mix it for a while before you jump in. The mix needs to be combined until it easily forms a bowl. Add some extra flour if it is too sticky. 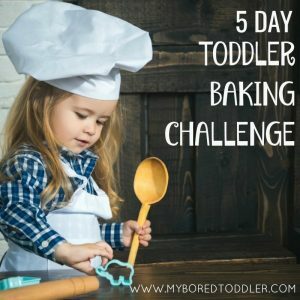 Have your toddler Kneed the flour on the cutting board (add some flour to the board so it doesn’t stick). Keep doing this until the dough is a playdough like consistency and not sticky. Add more flour if needed. 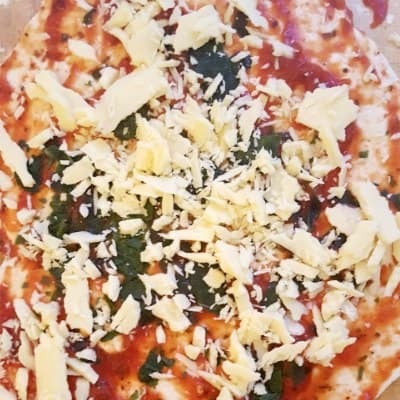 Help your child to roll out their dough into a rectangle shape (it doesn’t have to be perfect). Once again let them have a really good go before you go in and fix it up for them. Add your toppings! We start with some tomato past and use a spoon to spread it on. Then add your ham and cheese and whatever else you want to include. For this part it’s easier to have the toppings ready to go in small bowls so they can just throw them on. This doesn’t have to be perfect so just let them go for it! 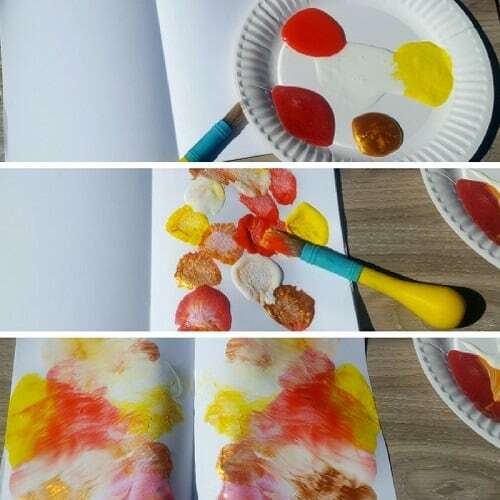 Help them to roll up the scrolls so that it looks like a long sausage shape. Cut the roll into 3cm (approx) pieces. You should be able to cut these with a blunt butter knife so your child can help you (I put my hand over theirs so it feels like they’re doing it, but really I am) , but you can use a sharper knife and do it yourself if you prefer. 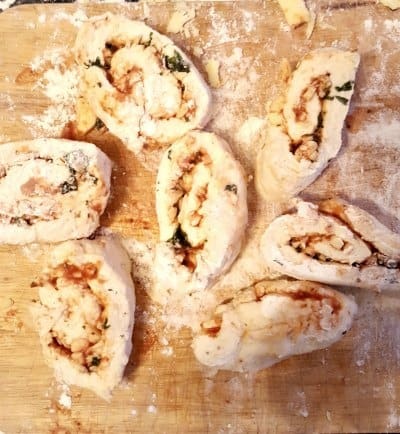 Place the scrolls onto an oven tray and bake until golden brown.